The plan was to kayak the Great Glen Way, 79 miles thereabouts, from Fort William to Inverness along the Caledonian Canal …..
‘Well if we can’t paddle, why don’t we walk instead?’ Another of my bright ideas, voiced as we nursed a broken car home, having barely left Cornwall on our planned trip to kayak the Caledonian Canal. ‘After all, we have the map and all the B&Bs are booked.’ What we did not have, to enable us to continue with the original plan, was another vehicle that would carry the kayaks. But we did have a motor home that would get us to Scotland. Everything was unpacked and repacked before I actually stopped to look at the Great Glen map with a view to walking rather than kayaking. Ah! Day 1 was fine, less than 20km, but days 2 and 3 were nearly 40 km each and the final day more than 30km. Of course these intervals had been set up for paddling, rather faster and more direct than walking. Oh well, we were used to walking up and down mountains for considerable distances; it shouldn’t be a problem! Fort William, where it all begins for us. A last look back ……and we’re off, just 127 km to go! We stop to enjoy the view and chat with fellow walkers who intend to take 7 days to complete the trail! Looking down Neptune’s Staircase ………………………… The top of the Staircase and our day’s climb done! 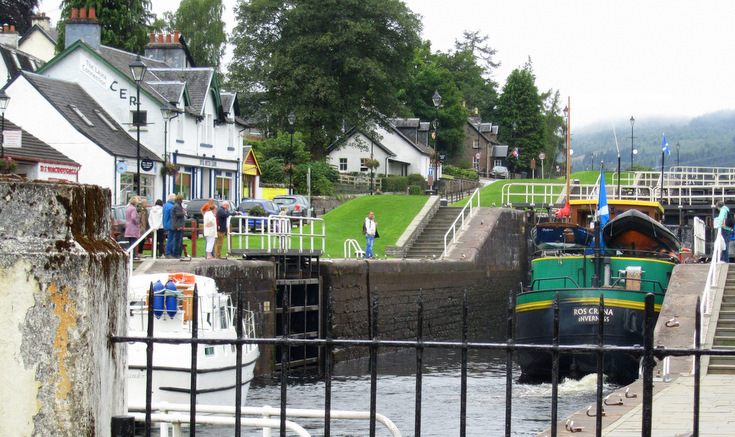 Neptune’s Staircase here at Banavie on the Caledonian Canal is the longest staircase lock in Britain. It was designed and built in the early 1800’s by Scottish engineer and architect, Thomas Telford. It takes about 90 minutes for boats to pass through the eight locks, with a height gain or loss of 19.5 metres. The path may be a bit samey, but it is very rural and the distant views are pretty good. Looking up … and down. We’re crossing the Loy Aqueduct but without the map we may not have noticed! 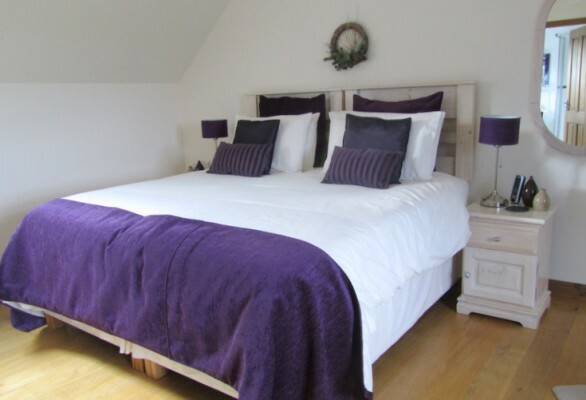 A beautiful bedroom in a delightful B&B – Dalcomera, Gairlochy. Our hostess was lovely and the roast chicken supper delicious. 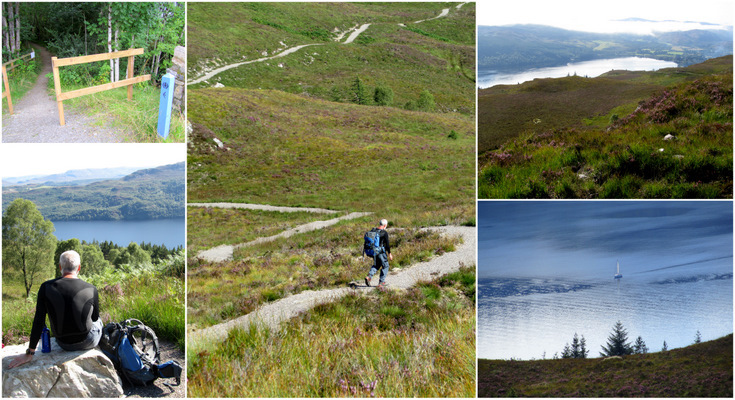 For plan A (the kayaking), we had pre-booked 5 B&Bs through www.booking.com Fort William, Gairlochy, Fort Augustus, Drumnadrochit and Inverness. As there are no eating out options in Gairlochy (closest Spean Bridge 6 miles away), we had arranged to have supper at our B&B. 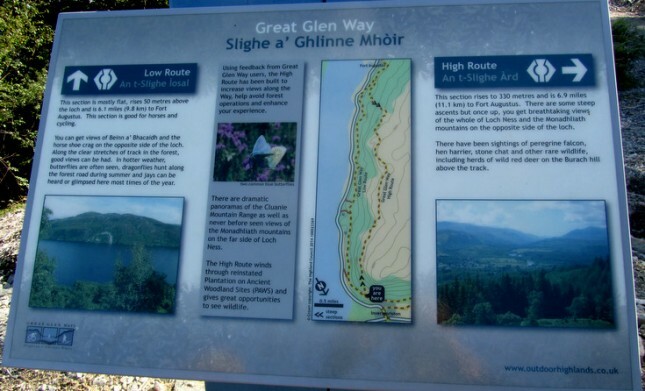 Many people wild camp when walking the Great Glen Way, however midges abound and it does entail carrying a heavier pack. Others use luggage ferrying companies, transport off route to suitable lodgings or route variations that include more overnight possibilities. The young German couple, with whom we had stopped to chat at Banavie lower loch, were not wild camping but had not booked anything in advance. They had to hitch a lift to Spean Bridge to find somewhere to stay that first night. 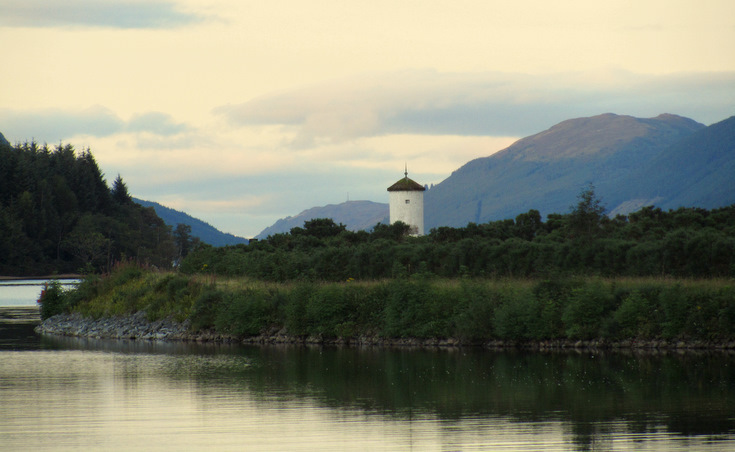 Enjoying a packless, but not midgeless evening stroll, including the Pepperpot lighthouse at the end of Loch Lochy. Today’s path is rather more varied and definitely gentler on the joints. This area was used for Commando training during WW2; a series of information boards provide very interesting reading along the way. Lengthening shadows and a delightful path. Breakfast brought a decision. ‘My joints won’t take another 40ish km pounding just yet. I want to walk, but not all the way to Drumnadrochit. Let’s look for a bus timetable and see what’s possible.’ What was possible was the 1515 bus through Invermoriston. Decision made, for me at least. A busy morning through Jacob’s Ladder, Fort Augustus, where traffic from Loch Ness climbs to join the Caledonian Canal. This was one of the variations/changes not shown on our map. There are now both high and low level routes between Fort Augustus and Invermoriston. As we were no longer so pressured we had no hesitation in choosing the longer high-level variant; it would be much more interesting with much better views and more varied for the joints. The observant will notice that this is the information board from the other end of the route, we failed to record the first one! The path begins to drop into the forest above Invermoriston. Unfortunately the shortcut on our map no longer appears to exist but we made it with time for a half before catching the bus. 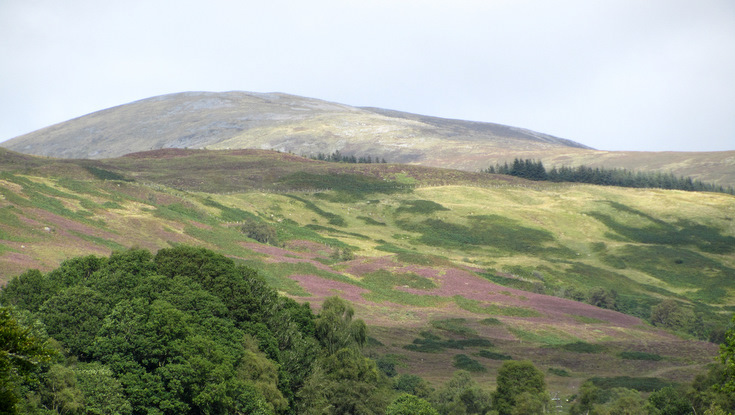 We stayed at another delightful B&B, Woodlands, in Lewiston just south of Drumndrochit and ate a lovely meal at the Loch Ness Inn 5 minutes away. At last, the route is sign posted off the main road – An interested observer – This is much better than the road – Still a misty morning but very atmospheric – Picturesque, but very isolated living. The long road back – And rather more blue looking forward. The finish, we did it! Well almost, there was a little bus ride! 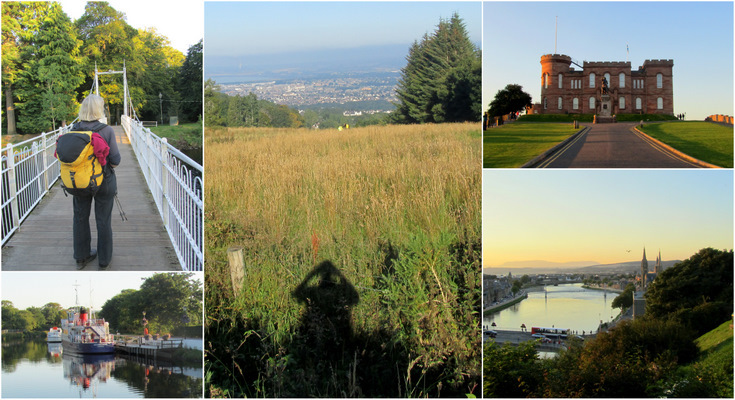 Distance was okay, but flatness is surprisingly hard on the joints when you’re used to hills and oh, the unyielding nature underfoot of much of the Way – worse than tarmac! 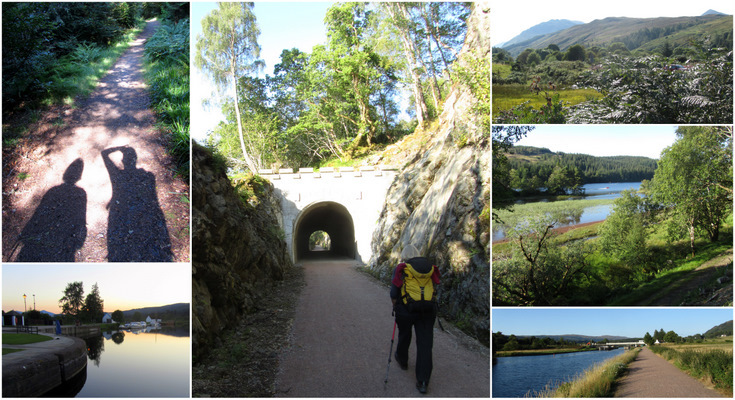 We do intend to walk the missing section between Invermoriston and Drumnadrochit, and indeed kayak. But first we are going back next May to sail the Caledonian Canal with friends. In Inverness we stayed at our final delightful B&B, Invernevis, Fairfield Rd. As Great Glen walkers we were greeted with cold beer and cider. Our hostess also followed a good Scottish family tradition and supplied a ‘wee dram’ as a nightcap.